A simple yet powerful app that plays the most recent news updates from multiple sources with just one tap. Now available on the iTunes and Mac App Stores. top-of-the-hour updates from multiple news sources. 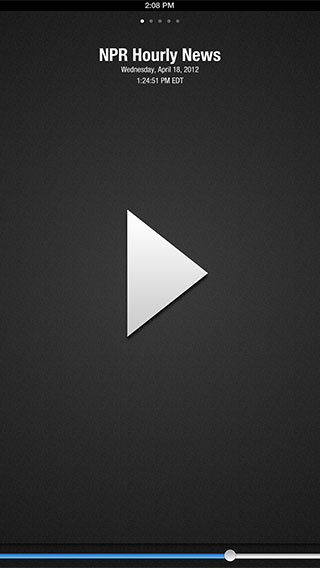 All it takes is one single tap to start playing the latest news. No hunting down webpages, no clicking refresh, no waiting. Just back-to-back news from all your sources, with just one tap. 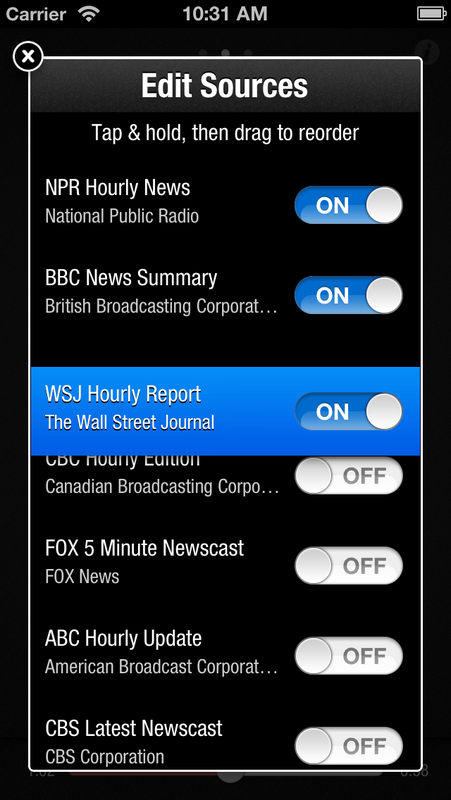 Choose from any or all of the available news podcast sources. 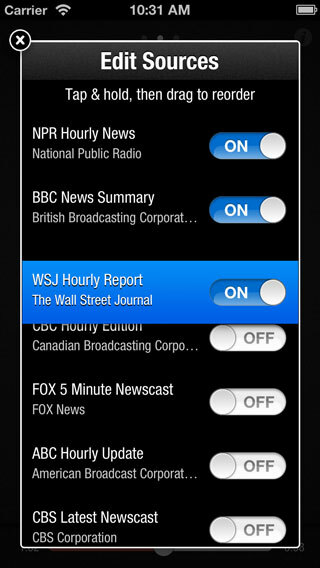 You can enable, disable and reorder them any way you choose, so you only get the news that's important to you. You can even add your own custom podcast sources! 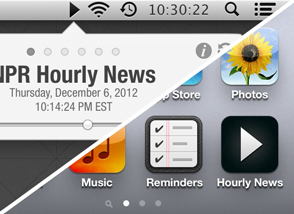 Whether you are using the Mac App, the iOS App or both, you will love the simple, easy-to-use appearance of Hourly News. We stay out of the way so you can focus on just the news. You can even add your own custom podcast sources. 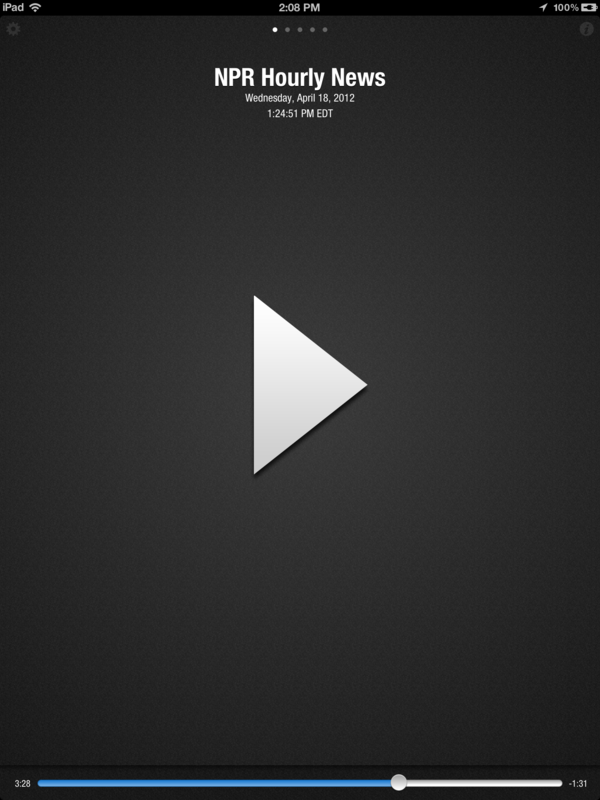 Any audio podcast that conforms to the standardized podcast format can be added. 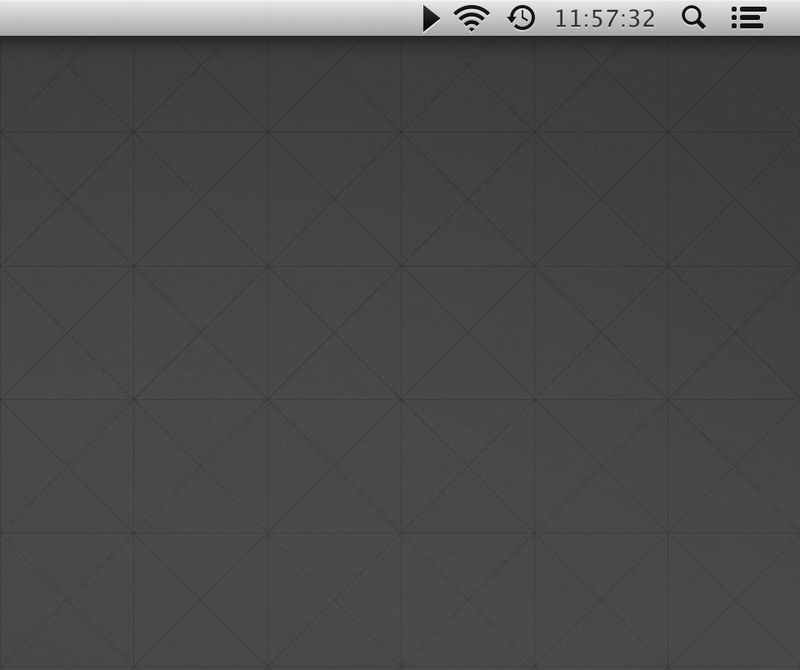 Available on both the Mac and iOS version as a one-time in-app purchase.
" It can be tough to keep up with the news all day while working. ... We happen to like the radio, but find the constant talk distracting. 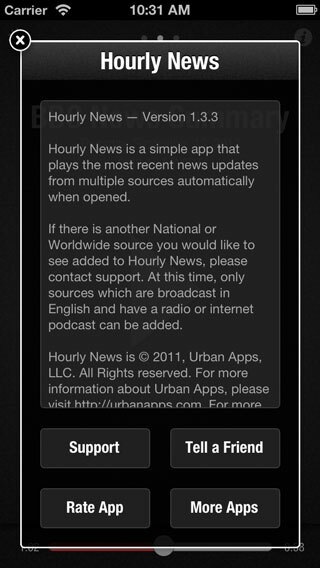 That’s why we’re intrigued by Urban Apps’ Hourly News ... It seems to us a good way to get a brief news fix. " " I use Hourly News to keep on top of national and world news at work, especially when I'm busy doing other tasks. If you're feeling overwhelmed by the deluge of media in your day-to-day activities, Hourly News is great for making sure you're still on top of things without constant media exposure. " 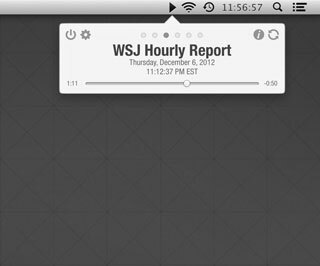 " I love Hourly News’s simplicity and easy access—too many times I’ll collect podcast episodes without ever listening to them, but the app provides an easy incentive for listening while on a tea break or washing dishes. It’s the perfect addition to a news junkie’s computer. " 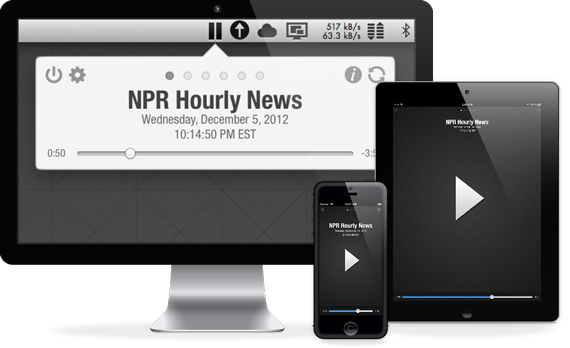 " Hourly News is a very simple idea, but executed perfectly. 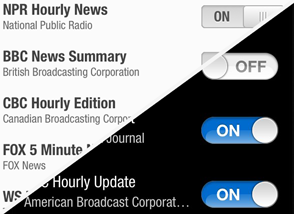 In case you really like listening to the latest news, or in case you’re already streaming audio using some other application, Hourly News won’t let you down. Its interface is simply beautiful, and it will perfectly incorporate into your everyday computing. " 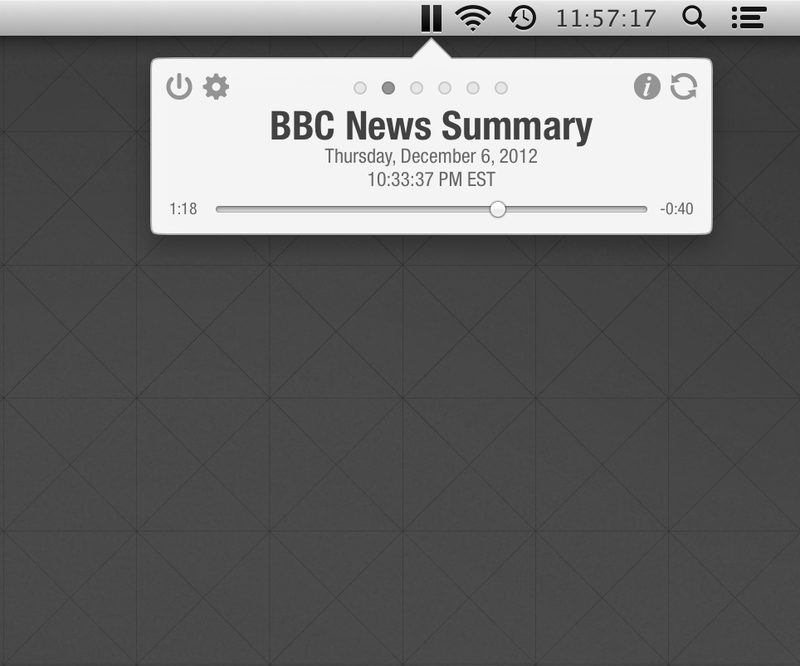 " ...absolutely love this app for the Mac. As a kid, I remember sitting in the car around the top-of-the-hour and waiting for my dad to turn on the radio for the news updates. 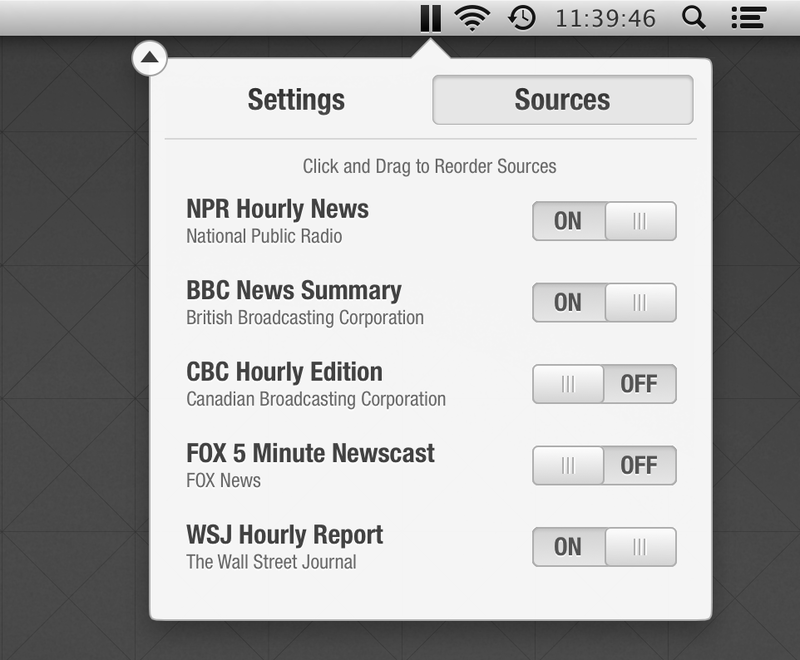 This is that, but from a wide variety of sources (NPR, BBC, ESPN, etc) and always right there on your desktop. Brilliant idea. 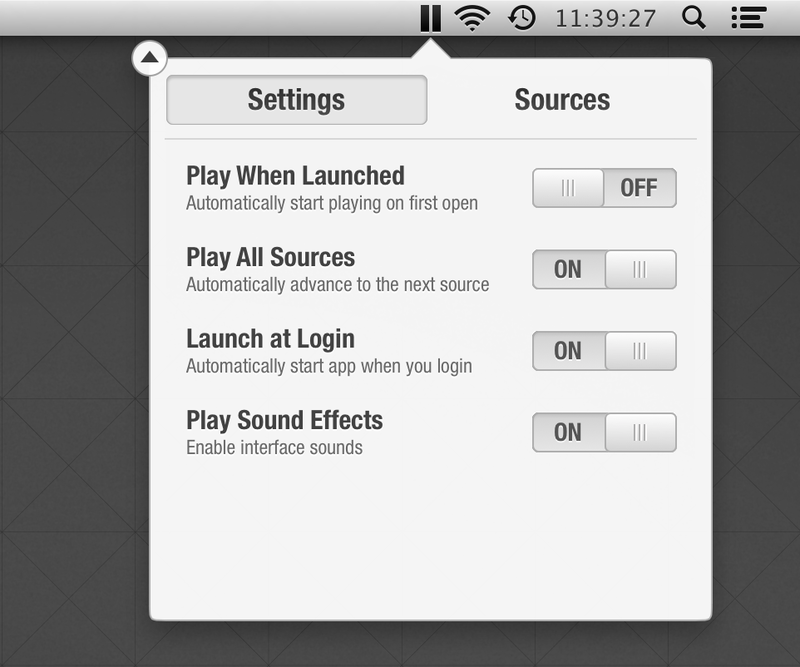 ...Yep, iOS version just as awesome. " 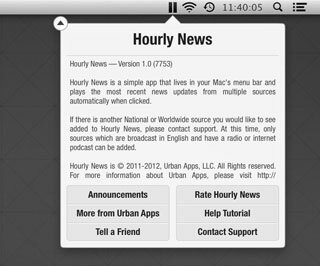 " Whether purely for the sake of nostalgia or for actually taking in the information, Hourly News App will present you with a collection of up-to-the-hour news... I would rather have one app do one task extremely well than an app which poorly presents me with four separate options and Hourly News App takes advantage of people who think along the same lines. " " If you’re looking for a simple way to keep up with the top news stories throughout the day on the iPad, it doesn’t get much easier than Hourly News. I’m checking it often and finding it a real pleasure to have on my iPad. " " Hourly News is a very straightforward app that does one thing very well. 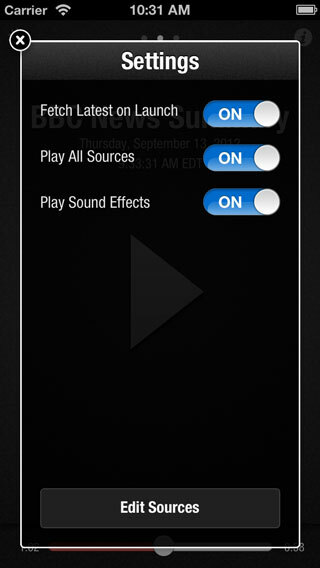 It makes it extremely easy to play the recent news updates from some of the most popular and prominent news sources. " 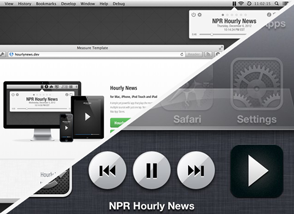 " Hourly News is perfect for the user who likes those quick roundups from popular sources like the BBC or CBS. 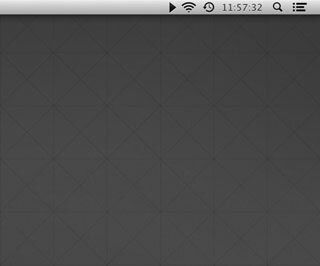 Overall, Urban Apps’ little menu bar utility is the best thing you can get for the job. It's great for listening to quick reports without the need of a Web browser. 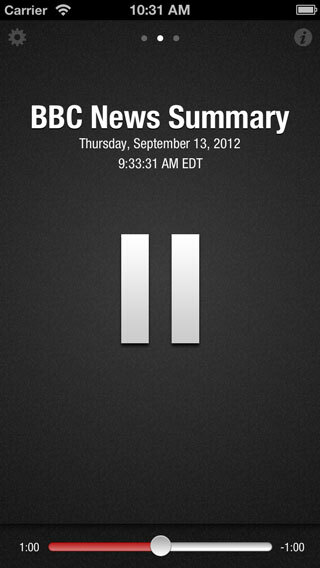 — 9/10 "
" Hourly News app was very simple and straightforward. 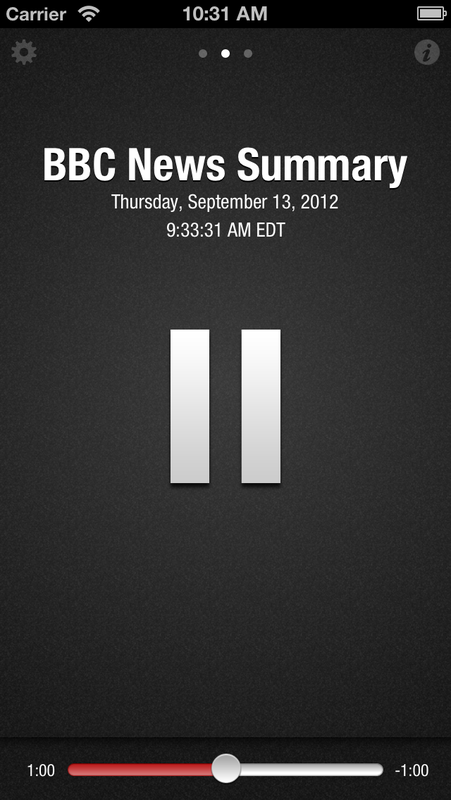 I really like the idea of being able to listen to quick, concise news segments on-the-go. 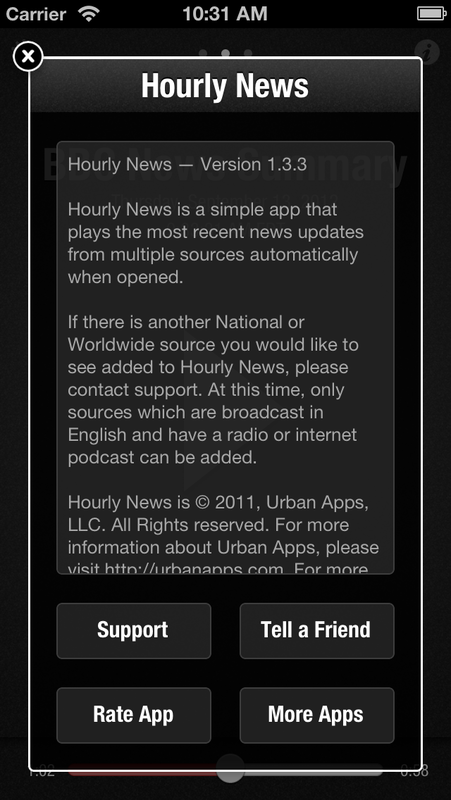 I recommend this app to anyone who would like to stay in touch with the world news, but has limited time to do so. " 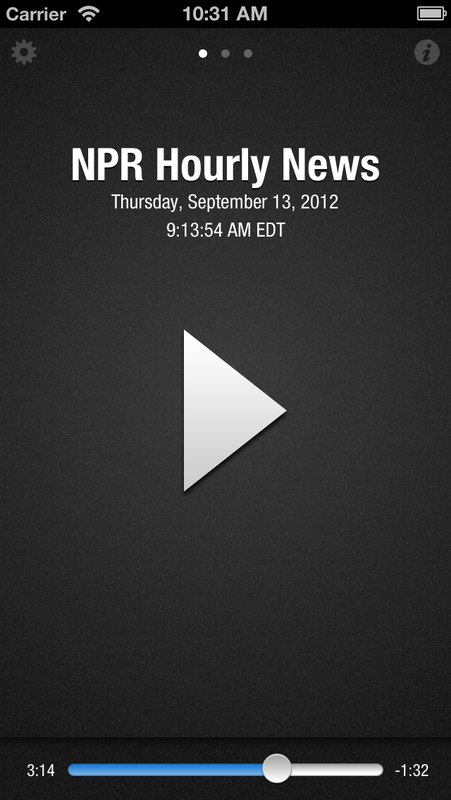 "Hourly News is a simple, easy-to-use news app ... features elegant, minimalistic user interface."